The first phase of Istanbul New Airport will be operational on Oct. 29, 2018. The last 15 years have witnessed the completion of many mega projects. The trend of constructing and operating transportation and infrastructure projects will continue in 2018 with new airports, tunnels and other infrastructure development. Minister of Transport, Maritime Affairs and Communications Ahmet Arslan said 2018 would be a year of mega projects in transportation. Noting that the first phase of the Istanbul New Airport, also known as the Third Airport, will be completed and open for service on Oct. 29, 2018, Minister Arslan said the bidding for the Kanal Istanbul and 3-Story Grand Istanbul Tunnel projects will also be held in 2018. Istanbul's new airport is one of the biggest infrastructure projects in the world with an estimated investment cost of 10.5 billion euros. Minister Arslan said after the completion of detailed modeling and fieldwork studies on the selected project area for Kanal Istanbul, it will be given its final design. "Alternative financial models are also being studied within the framework of the models, such as a build-operate-transfer [BOT] model," Arslan said, indicating that completion of the engineering work in the first quarter of 2018 will be followed by preparation, including financial models, in the first half the year, and then the ministry plans to launch a tender for the project's construction. Speaking to Turkish Sabah daily, Minister Arslan explained the details of the transportation investment scheduled for 2018. Recalling that Turkey continued its growth through investments and industrial production in 2017, Arslan said the strong pace of investments and employment would support Turkey's growth through domestic demand in 2018. Minister Arslan said they will maintain their investments next year in the framework of the 2023 targets, as well as the 2053 and 2071 visions, and that giant investments, such as Kanal Istanbul and the 3-Level Grand Istanbul Tunnel project, will continue. He also stressed that 2018 will be an important turning point for the vision of Turkey, and added that Turkey has already been able to: Expand its high-speed railway network, form a fast railway corridor, renew existing roads, build a local railway industry that connects production centers and industrial areas to ports, domestically produce a national high-speed train, strengthen competitiveness in the country with logistics centers and become the central country of the Silk Road. Highlighting that the number of private sector operators providing services in railways will increase in 2018, Arslan said they will carry passengers as well as cargo on the Baku-Tbilisi-Kars (BTK) Railway line, one of the most important rings of the modern Silk Road, adding that they will also increase the amount of cargo carried on the BTK Railway Line in 2018. Arslan said within the scope of the Kanal Istanbul Preparation and Consultancy project engineering work continues and alternative corridors for the project's route were specified in the first stage. Arslan noted that work continues between these corridors, taking into account vitality, geological and topographic effects and existing infrastructure projects of the institutions. Stating that after field studies, including detailed geotechnical and hydraulic modeling, are conducted on the selected project area, it will be given its final design, Arslan said preliminary preparations for Environmental Impact Assessment (EIA) studies also continue in this area. He added that in this respect, the canal shaft and width will remain within the selected area, and that the canal route and section will be finalized as a result of the preparation work. Within the scope of the preparation work, Arslan said financial models are being studied to realize the project, while alternative financial models are also being studied within the framework of public-private partnership (PPP) models, such as build-operate-transfer. Minister Arslan added that after the completion of engineering in the first quarter of 2018, followed by preparation work, including financial models, they plan to go to tender for the construction of the project. PPP model projects are not a new concept for the Turkish economy. Since the early 1980s, Turkey has implemented numerous projects with this financial model to build highways, airports, railways, hospitals, energy facilities and ports. Over the last decade, a large portion of the most pronounced mega projects, including Yavuz Sultan Selim Bridge, the Eurasian Tunnel, the Istanbul New Airport, Osmangazi Bridge, city hospitals in Yozgat and Mersin, and the Istanbul-Ankara High Speed Railway, were completed with the successful and efficient implementation of the PPP model. From 1986 to 2016, 47.9 percent of projects have been complemented by a financing model that includes public-private partnerships, while it accounts for 62.8 percent of the total contract value of these projects, according to data compiled by the Ministry of Development. With a contract value of $67.5 billion, airport projects completed via the PPP model rank first in sectoral terms compared to energy projects, which have a contract value of $25.3 billion, coming in second in the PPP market. Energy projects are followed by highway projects and health facilities, which are valued at $13.6 billion and $10.6 billion, respectively. Arslan said they would continue to develop and expand the airline sector, which has transformed impressively over the past 15 years, with giant investments in 2018. "Today, we have 55 active airports, and we are among the top eight in the world passenger ranking. We are also among the top three in Europe," Arslan continued. "We aim to reach 205 million passengers by 2018. We will continue to build new airports in this context." 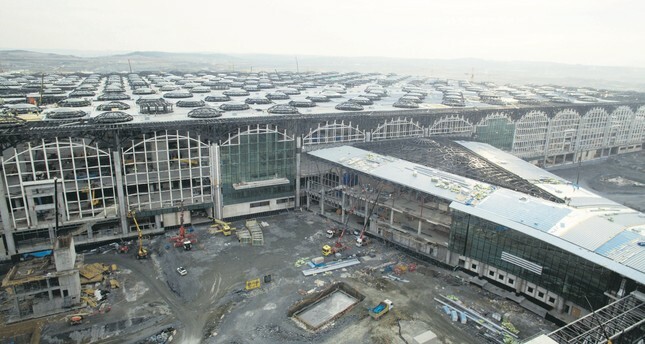 Arslan said they would open the first stage of the Istanbul New Airport, which will serve 90 million passengers, on Oct. 29, 2018, adding that construction of the Rize-Artvin airport is under way, while construction work for the Karaman, Yozgat, Bayburt-Gümüşhane and Tokat New airports will be initiated throughout the year. Minister Arslan announced on Friday that Turkey's state run Post and Telegraph Organization (PTT), the Turkish post office, will launch delivery services with unmanned aerial vehicles, or drones, in 2018. Arslan also indicated that the ministry has made a total investment of TL 29.5 billion ($7.78 billion) and will invest TL 28.8 billion in 2018. The total cost of the 123 projects that the ministry completed in 2017 is TL 15.9 billion. Railway investments were TL 8.7 billion, while this amount will jump to TL 14.2 billion in 2018 as the ministry works to expand the network of railways. Maritime investments in 2017 stood at TL 518 million, which will be raised to TL 717 million. The communication sector received TL 1.2 billion in investments, and the ministry will continue investing in the sector, while raising the amount to TL 1.9 billion.